You’ve traveled all around the country on your last dollar. Every time just barely making enough to keep you going. Keep your feet covered, a jacket on your back, and a ramblin’ on. Always got to keep moving. Keep going forward. You are a gamblin’ man. The kind that knows when to hold ‘em, and knows when to show ‘em. At least most of the time. Sometimes you need might need a little extra help when things don’t go quite how you thought they would. And that help comes with a few cards up your sleeve. And maybe a .22 in your ankle holder. Well, a gambler’s got to keep himself safe, are we right? That is also why you’ve got to keep roaming around. Yeah, you got the skills, and you have the cards (the extra cards that is), and you know when to get the heck out of Dodge. But you are still missing something important. The look of a real gambler. 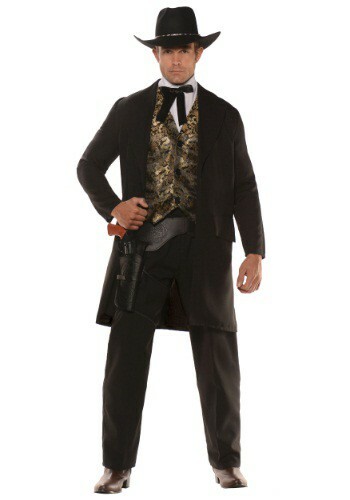 This Men’s Plus Size The Gambler Costume is just the thing you need. It will make you look like the gambler you are at heart. That way you can walk into any casino, or gambling house and walk away a rich man…as long as no one sees you swapping those cards out. You might want to pick up a Colt .45 to keep yourself out of any shallow holes in the ground.